Winamp is more than just a player. It's your window to the multimedia world. From MP3s to streaming video, Winamp is the one place you go to feed your audio/video habit. Shift the sound from both speakers to left or right using the Balance slider. Enable Cross Fading to transition the audio smoothly from one song to another. Select from the dozens of EQ presets to tune the sound. Support for Windows Audio (WASAPI) Output plug-in (w.i.p.) added. 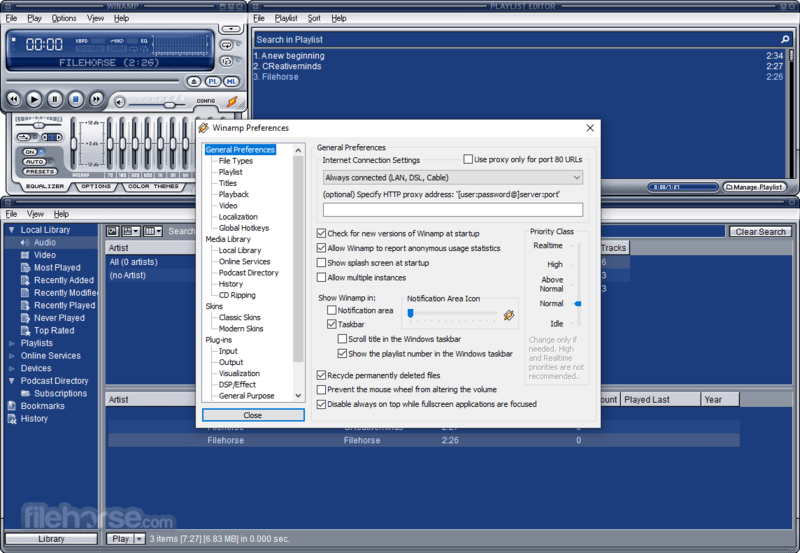 You can now completely disable Winamp’s video support and use it as a standalone audio player. The update has added an auto-fullscreen option to video prefs. This update has brought support for Windows 10 and Windows 8.1. The OpenMPT-based Module Player has replaced the old MikMod player. You can use Ctrl+E editor to browse the path and edit title functions easily in Winamp. The scrollbars and buttons have been updated. This is change is only visible in Bento skin. Winamp now has a player list feature and it’s available in Bento and Modern skins. A bug where the URLs failed to remember after the users performed Reset history in Open URL dialog. 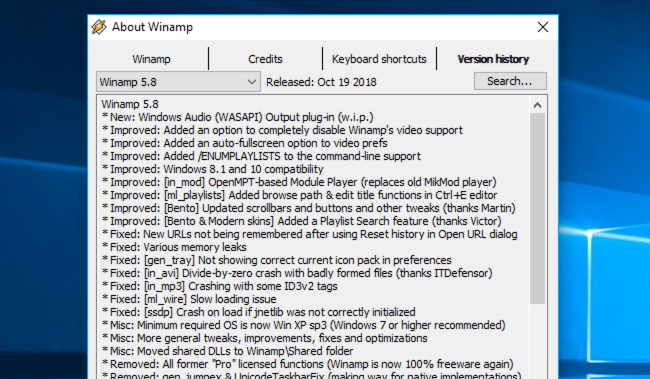 What is New in Winamp 5.63? All Winamp Media Player reviews, submitted ratings and written comments become the sole property of Windows 7 download. You acknowledge that you, not windows7download, are responsible for the contents of your submission. However, windows7download reserves the right to remove or refuse to post any submission for any reason. Windows 7 Download periodically updates pricing and software information of Winamp Media Player full version from the publisher, but some information may be out-of-date. You should confirm all information. Using warez version, crack, warez passwords, patches, serial numbers, registration codes, key generator, pirate key, keymaker or keygen for Winamp Media Player license key is illegal and prevent future development of Winamp Media Player. Download links are directly from our mirrors or publisher's website, Winamp Media Player torrent or shared files from free file sharing and free upload services, including Rapidshare, MegaUpload, YouSendIt, SendSpace, DepositFiles, DivShare, HellShare, HotFile, FileServe or MediaFire, are not used. CD playback is broken in W7x64 using 5.63. Went back to using 5.58. Works perfectly now.